Doing laundry is not something you expect a princess to do but with this Sofia The First laundry basket even a princess will love putting the laundry in the hamper. 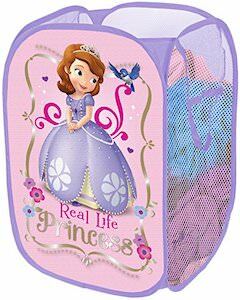 The laundry basket shows Princess Sofia The First on the front with the text “Real Life Princess” below her and the rest of the basket is mesh. And when there is not laundry to be stored you can fold the princess hamper down so that it takes up less space. Besides laundry, you could use this hamper for other things to like maybe all the plush toys your child owns.